"The truth is that everyone, regardless of age, is already setting patterns for the shape of his or her life. 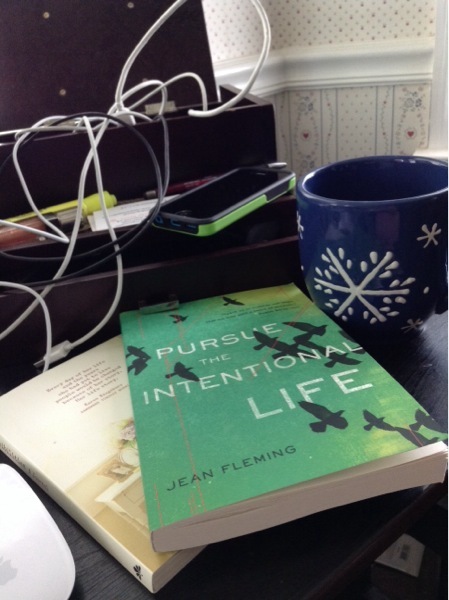 These patterns of though and practice will either serve the glory and purpose of God or hinder them" (Jean Fleming, Pursue The Intentional Life, 16). "Vision, values, character, and disciplines developed in the springtime of life serve even in the winter. Whatever the age, it is not too soon to prepare for the rest of life" (Fleming, Pursue the Intentional Life, 32). A new book arrived on my doorstep yesterday. Jean Fleming's Persue The Intetional Life. Not that I need to be reading one more book, I'm already reading several! But this one was given to me for the Bloom Book Club. I'm a few weeks behind, so I'm trying my best to zip through the first chapters of the book and make up for lost time. At the beginning, Fleming talks about the end, the last years of her life here on earth, however many they may be. It's kind of strange reading a book by a woman a good 40 years ahead of me in life. She writes about life in her 70s, while I'm still wrangling babies at home. But then, she seems like an amazing mentor. A woman of God who has seen a lot in this life and has some important things to say. Perhaps she's the very woman I need to be gleaning from right now. She's writing to encourage all of us as woman to be conscious about the life we're living now. Because who we are now, only concentrates over time. Lately, I've been on a quest to realize who I am. To truly identify the things that make me tick, the passions God has placed on my heart. To live completely for Him in the place, in the things He's called me to do at this moment in time. This book couldn't have come at a better time. There are definitely areas of my life that need work, things I wouldn't want to let go unheeded for another 40 years. And so, what to do? Be conscious of those things, and work on improving them. Start righting wrongs right now, start yielding myself to the Spirit, so that I only become more like Him as time passes. Don't neglect the things that need attention, the things that will only become worse as the years go on. Oh how I long to become more like Jesus, but that takes time and attention. It takes prayer, and a good bit of journaling on my part. It takes honesty, not something I always like doing with myself.